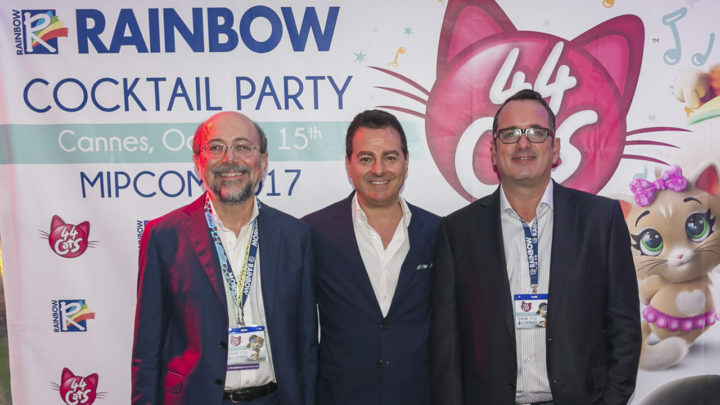 News > Rainbow Lights Up Cannes With Glittering 44 Cats Cocktail Party! Rainbow Lights Up Cannes With Glittering 44 Cats Cocktail Party! On Sunday night, Cannes hosted what was a highlight of the MIP Junior – a cocktail party to celebrate the launch of “44 Cats”, the brand new pre-school animation project by Rainbow. “44 Cats” is the first Rainbow production jointly developed with Bardel Entertainment, the Canadian animation studios acquired in 2015. “44 Cats” is a stunning CGI comedy show that combines music, edutainment, top quality animation and acting. The show addresses important themes such as diversity, friendship and altruism, elements that give the new pre-school property a huge international appeal to succeed in the global market. The launch cocktail party took place at Cannes Grand Hôtel, where a host of entertainments offered the guests a taste of the show atmosphere. One of Rainbow’s artists was at the party to show how a 44 Cats character is drawn; a band performed hits including songs from the series and guests could enjoy funny moments dressing up as cats at the special “44 Cats” photocall area, where an official photographer was on hand to take amazing snaps! The evening was a success and the best way to celebrate the launch of such a meowing new show!